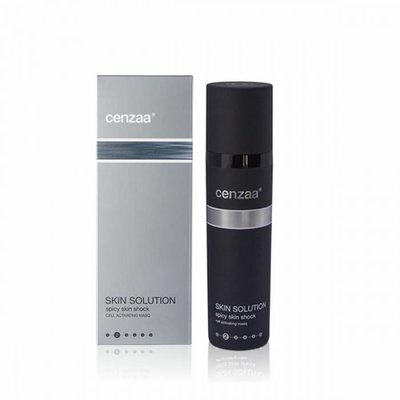 Cenzaa Spicy Skin Shock is an indispensable product that competes with skin aging and skin problems. Spicy Skin Shock gives the skin a very intensive boost, smooths and strengthens and creates a radiant skin of face, neck and décolleté. Revolutionary boost for the skin! Spicy Skin Shock is an indispensable product that competes with skin aging and skin problems. Spicy Skin Shock gives the skin a very intensive boost, smooths and strengthens and creates a radiant skin of face, neck and décolleté. Stimulates cell activity, improves circulation immediately and transports the active ingredients deeper into the skin. Immediately after application, you will feel that your skin has received a powerful, intense pulse of oxygen. The product Spicy Skin Shock, from the therapeutic Profusion line, requires specific advice from your Cenzaa Huidexpert. General advice: use the mask 3 times a week or every day with a treatment for radiant skin. Build the exposure time carefully so that you and your skin can get used to the intensity of the Spicy Skin Shock.